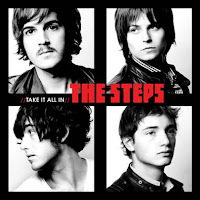 Austin rockers The Steps channel a bit of Brit-pop and add in a dash 70's garage glam rock to come up with a modern rock sound that makes for a fun mix of tunes. They have an EP, Take It All In, that will be released on July 21. I'm looking forward to checking out this release. If you're in the New York area, they're playing at Webster Hall on June 6. I'm really digging the single "Cold Floors." Download it HERE.